As the name implies, The Old Spaghetti House is known for their pasta and pizza dishes that would satisfy one's palate. Ace and Aldous had organized a blogger's dinner event at The Old Spaghetti House to try the dishes on their new menu. I was excited that I storm the rain to get to Katipunan. It consists of grilled chicken and apple in a bed of greens dressed with their home blended garlic mayo and topped with slivers of almonds. This salad is awesome, I wouldn't mind eating just this. This appetizer consists of squid, mussels and other seafood pieces battered and deep fried, then served with Thai Chili Mayo on the side. These Ham and Cheese Croquettes tasted okay, you can taste the texture of the ham bits. I wish it would have been more cheezier. The spinach cheese dip was delish. Better consume the wonton while it's warm because they tend to get tough when it gets cold. It's chili con carne topped in a pasta. If you are in for some fiery kick in your pasta, this would be your pick. I'm not in for something spicy that night, so I just bite a bit, got shocked on how spicy it was, and moved on to the other pastas. It consists of Grilled Chicken Inasal with Penne. It had the inasal taste, which will make you order for a cup of rice. I'm not too fond of it in pasta form. It is cream-based dish with bacon, mushrooms, spinach and a fried egg. It lacked a bit of cream to give it more texture, but it tasted like your favorite carbonara with a take on our breakfast staple food, egg. It taste like a seafood ramen, which I love. I'm just not sure of the spaghetti noodles, if it went well with the broth. I loved sipping on the broth along with the seafood toppings. This dish tasted like your typical roasted chicken. Slather some gravy to enjoy this dish. It comes with gravy, shoestring potatoes and salad as sides. I loved how this dish was savoringly yummy. The flavor of the chicken complements the jambalaya rice, with the added bonus of a side salad. The Angus strips were soft and tender, but the sauce was a bit overpowering in my opinion. Some may love it because it would make you want another cup of rice to satisfy your tummy. We had this sampler pizza which consists of four great flavors: Margherita Pizza, Seafood Pizza, Pinoy Pizza and the other one with Arugula that I forgot the name. All tasted delicious. I love that The Old Spaghetti's pizzas uses thin and crispy crust which I enjoyed munching on. This is the newest addition to their pizza selection. It's made of tapa strips, grilled tomatoes and salted egg as toppings. Some will find the taste salty or too savory, mainly because of the salted egg toppings. But for me, this is one delish savory pizza. These cookies are the bomb. I didn't even realized that TOSH offer baked goods as well. 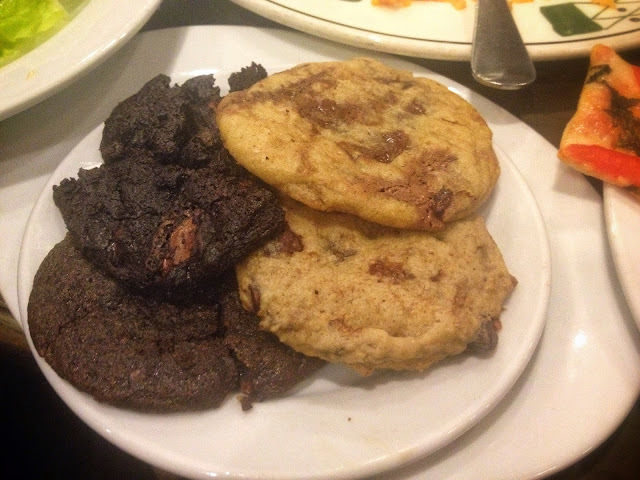 We tasted Gluten Free Flourless Double Chocolate Chip, Double Chocolate Chip and Belgian White Chocolate Chip cookies. The cookies were soft and chewy, just the way I liked it. I'm all for the soft, moist and chewy cookies. Kudos for TOSH for this wonderful creation. Van Dough cookies are available in selected TOSH branches in the following variants: Double Chocolate Chip, Belgian White Chocolate Chip, Banana-Walnut Chocolate Chip, Gluten Free Flourless Double Chocolate Chip, Chocolate Kiss, Lace Cookies and Choco Caramel Cookie Bars. There were a lot of dishes that night. But if I were to choose the top 3, I'd go with Van Dough Cookies, Grilled Chicken, Apple and Almond Salad, and Jambalaya Chicken. All the new dishes are available on all TOSH branches. I can't wait to go back and try their bestseller pasta and pizza dishes. What are your favorites at TOSH? Share it on the comments below!